Up To 25% Savings With New Driving Device! Not everyone has good driving habits. That’s why the program my Driving Discount was created, a program that rewards good driving behaviour. With the my Driving Discount you can save up to 25% off your auto insurance and 10% for enrolment. my Driving Discount is a simple device that you plug into your car; it will then start collecting the data needed to help you save. Some of the factors that get taken into consideration when calculating your potential discount are acceleration, braking, and the time of day you drive, based on kilometres driven. Increases the risk of being involved in an accident. The program then calculates the ratio of hard breaking events on total km driven to finalize your personalized hard braking factor. Increase the risk of being involved in an accident. Like hard braking the program calculates your ration of rapid accelerations events on total km driven to determine your rapid acceleration factor. At night between 12am and 4am increases the risk of being involved in an accident. This is caused by the minimum visibility and fatigue, making this time of day more risky to be on road. Ones again the program will evaluate the time of day you drive and produce your personalized high-risk period factor. The less you drive at night, the more you could save. 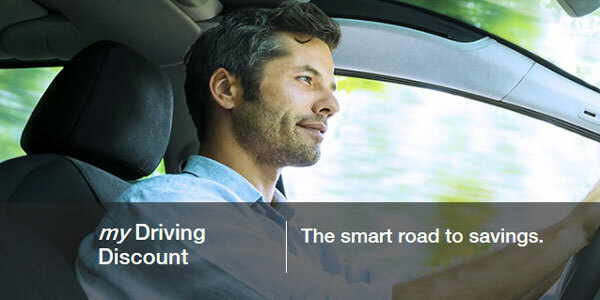 my Driving Discount is a must have if you are aware of the positive driving habits you possess; with its data-collecting program it will easily put you towards a road of savings! If you would like to know more information about the device please contact one of our brokerage today.